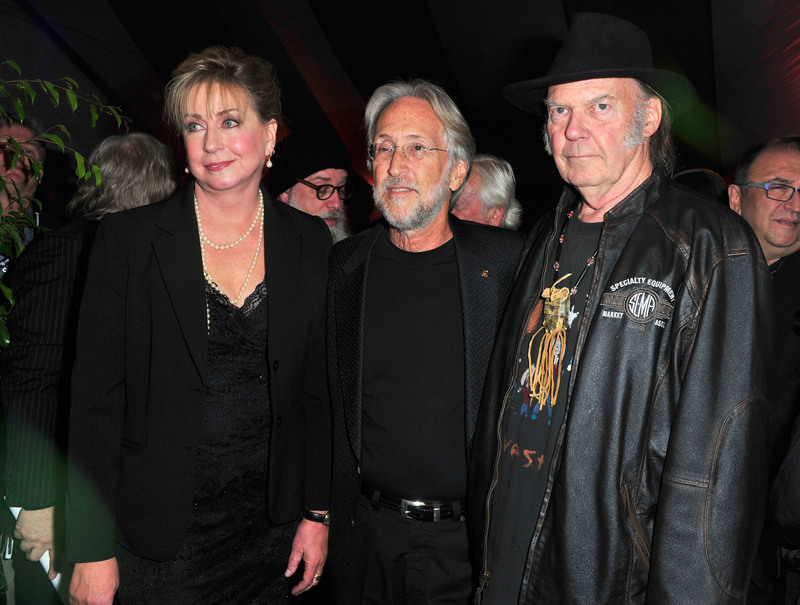 Pictured L-R: Maureen Droney, Senior Executive Director, The Recording Academy® Producers & Engineers Wing®; Neil Portnow, President, The Recording Academy; and honoree Neil Young, at the 56th GRAMMY® Awards P&E Wing Event Honoring Neil Young at The Village Recording Studios on January 21, 2014, in Los Angeles, California. Photo Courtesy of The Recording Academy® /WireImage.com © 2014. 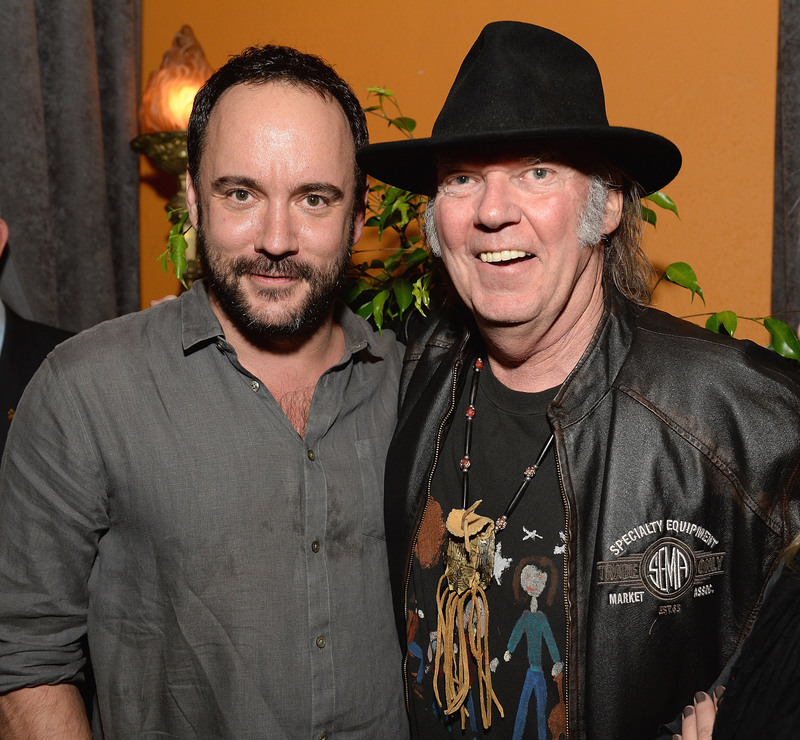 Pictured L-R: Dave Matthews and Neil Young attend the 56th GRAMMY® Awards P&E Wing Event Honoring Neil Young at The Village Recording Studios on January 21, 2014, in Los Angeles, California. Photo Courtesy of The Recording Academy®/Michael Kovac/WireImage. © 2014. Photographed by: Michael Kovac/WireImage. Key personnel from sponsors from the 56th GRAMMY® Awards P&E Wing Event Honoring Neil Young at The Village Recording Studios on January 21, 2014, in Los Angeles, California. Photo Courtesy of The Recording Academy® /WireImage.com © 2014. SANTA MONICA, Calif. (January 30, 2014) — Reprising what has become a highly anticipated evening that kicks off music's biggest week in the run up to the annual GRAMMY Awards®, the Producers & Engineers Wing’s seventh annual GRAMMY® Week Celebration was held on Tuesday, January 21, 2014. The event, which took place at The Village Studios in West Los Angeles, honors the contributions made by producers and recording, mixing and mastering engineers whose technical expertise and creative brilliance play a key role in recordings and often earn them GRAMMY Awards of their own. The event also highlights individuals who, in the words of Recording Academy President and CEO Neil Portnow, have "championed creative freedom and sonic integrity" throughout their career, and is the occasion for the presentation of The Recording Academy President's Merit Award. This honor has previously been bestowed upon Interscope Geffen A&M Chairman Jimmy Iovine, producer/musician T Bone Burnett and Island Records' Chris Blackwell, among other luminaries. This year’s event, which preceded the 56th Annual GRAMMY Awards on Sunday, January 26, 2014, airing live on the CBS Television Network, honored Neil Young, with Portnow presenting the award to the applause of hundreds of Academy and P&E Wing members and guests, including GRAMMY nominee Alex Da Kid, two-time GRAMMY winner Colbie Caillat, two-time GRAMMY winner Andrew Dost (of fun. ), GRAMMY winner Jakob Dylan, multiple GRAMMY winners Jimmy Jam and Terry Lewis, three-time GRAMMY winner Kris Kristofferson, and GRAMMY winner Stephen Stills. Young took the stage after an introduction delivered by Portnow, the P&E Wing’s Co-chair Mike Clink, founding member Ed Cherney, and Senior Executive Director Maureen Droney. A short biographical film chronicled Young's 49-year career, including his contributions as co-founder of Farm Aid and The Bridge School, which helps physically challenged children overcome their impairments via the use of technology. In fact, technology remains part of Young’s diverse activities, and after a heartfelt and often hilarious discourse on how the technology of music can get in the way of what an artist wants to say, he took the opportunity to announce that he would donate a one-percent equity stake in Pono, his soon to debut high-resolution digital music project, to the MusiCares Foundation, an arm of The Recording Academy that offers musicians a place to turn in times of financial, personal, or medical crisis. Despite his accomplishments, which include multiple GRAMMY Awards and landmark recordings such as Harvest and After The Gold Rush, Young proved himself to be profoundly humble, when he told the audience, "I'm just one of you. You honor me, you’re honoring yourselves. It's not me – it's what you do." Young's appearance was followed by a three-song solo set by GRAMMY winner Dave Matthews, closing with Young's "Hey Hey, My My." Audience members then circulated throughout The Village Studios, home to countless classic and GRAMMY Award-winning recordings, including Fleetwood Mac's Tusk and the soundtrack to O Brother, Where Art Thou? In addition to imaginative food and drink offerings, attendees were also able to experience wares displayed by the evening's sponsors, many of whom are from the world of professional audio: Platinum Sponsor AUPEO! (www.aupeo.com); Gold Sponsors AVID (www.avid.com), Westlake Pro, (www.westlakepro.com), DTS (www.dts.com), Shure (www.shure.com), Iron Mountain Entertainment Services (www.ironmountain.com), Music Marketing (www.musicmarketing.ca), and Presonus (www.presonus.com); Silver Sponsors Louisiana Entertainment Commission (www.louisianaentertainment.gov), PMC, Ltd. (www.pmc-speakers.com) and Korus (www.korussound.com); Bronze Sponsors B Fragranced (www.bfragranced.com), GC Pro (stores.guitarcenter.com/gcpro), Lurssen Mastering (www.lurssenmastering.com), Sound Exchange (www.soundexchange.com), Vintage King Audio (www.vintageking.com),Y-Jet(www.flyy-jet.com); and Participating Sponsors iZotope (www.izotope.com), Capital Bauer Studio Insurance Program (www.ajgrms.com/albany), Prism Sound (www.prismsound.com) and Full Sail University (www.fullsail.edu). Photo Caption 1: Pictured L-R: Maureen Droney, Senior Executive Director, The Recording Academy® Producers & Engineers Wing®; Neil Portnow, President, The Recording Academy; and honoree Neil Young, at the 56th GRAMMY® Awards P&E Wing Event Honoring Neil Young at The Village Recording Studios on January 21, 2014, in Los Angeles, California. Photo Courtesy of The Recording Academy® /WireImage.com © 2014. Photo Caption 2: Pictured L-R: Dave Matthews and Neil Young attend the 56th GRAMMY® Awards P&E Wing Event Honoring Neil Young at The Village Recording Studios on January 21, 2014, in Los Angeles, California. Photo Courtesy of The Recording Academy®/Michael Kovac/WireImage. © 2014. Photographed by: Michael Kovac/WireImage. 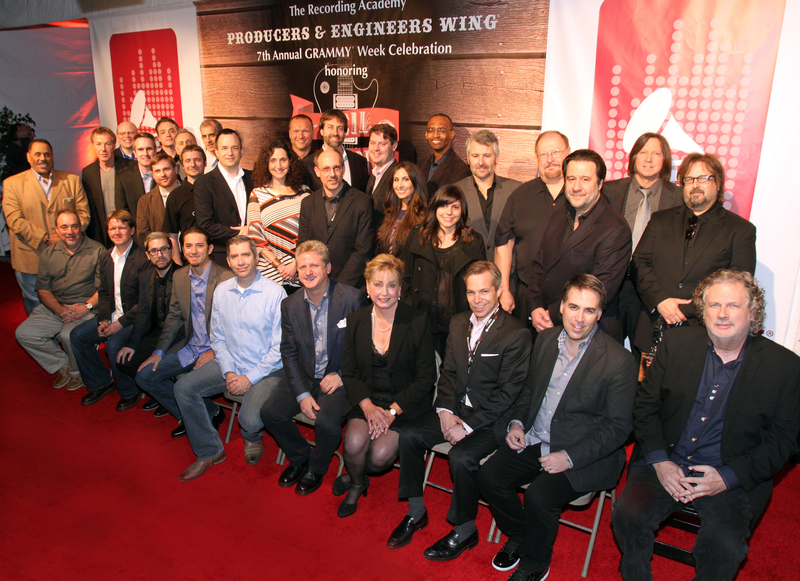 Photo Caption 3: Key personnel from sponsors from the 56th GRAMMY® Awards P&E Wing Event Honoring Neil Young at The Village Recording Studios on January 21, 2014, in Los Angeles, California. Photo Courtesy of The Recording Academy® /WireImage.com © 2014. Young's career began with his earliest recordings as a member of the Squires in Winnipeg, Canada, in 1963. He rose to prominence as a solo artist with classic albums such as 1970's After The Gold Rush and 1972's Harvest, and through work with bands such as Buffalo Springfield (Buffalo Springfield, Buffalo Springfield Again); Crosby, Stills, Nash & Young (American Dream, Déjà Vu); and Neil Young With Crazy Horse (Everybody Knows This Is Nowhere). He has also directed and released films through his production company Shakey Pictures, including Rust Never Sleeps (1979) and the documentary CSNY/Déjà Vu (2008). His most recent release, Neil Young With Crazy Horse's Psychedelic Pill,shows an artist fully grounded and firmly rooted in his work yet constantly evolving and living in the moment. Young continues to push artistic boundaries by releasing Neil Young Archives Vol. 1 1963–1972 in a variety of formats, including Blu-ray, thus allowing fans to continue to receive new Neil Young archival content as it becomes available. He has received numerous awards and accolades throughout his career including an Oscar nomination in '93 for his song "Philadelphia" from the film Philadelphia. He was inducted into the Canadian Music Hall of Fame in '82, and has twice been inducted into the Rock and Roll Hall of Fame — in '95 for his solo work, and in '97 as a member of Buffalo Springfield. In 2014, he will debut the highly anticipated Pono, his new high fidelity audio system. Young's philanthropic work is as renowned as his musical legacy. He was one of the original founders of Farm Aid in 1985, and continues to be an active member on the organization's board of directors. Each October, he and his wife Pegi organize and host the Bridge School Concerts, a benefit for the Bridge School that he and Pegi helped found. The school ensures that children with severe speech and physical impairments achieve full participation in their communities through the use of assistive technol­ogy and the development, implementation and dissemination of innovative educational strategies. These weekend concerts have drawn an international array of musical artists and have raised significant resources for the school. For more than four decades, Young has set a standard of artistic integrity and iconoclastic creativity and his achievements have been matched by his unwavering humanitarianism. Neil Young is a shining example of how music people offer their creative gifts to the world, and how they also give back through their commitments to charitable endeavors.